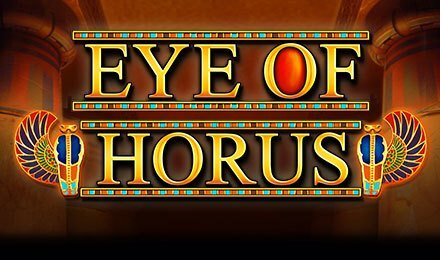 Eye of Horus slot is a Blueprint Gaming product, that features 5 reels and 10 paylines for you to play on. Themed on the Eye of Horus itself, a symbol of protection in Ancient Egypt, this game takes you to a world like you never seen. Find yourself inside a pyramid, where the 5x3 reel is set. Now, you can enjoy features like: wild symbols, scatter symbols, free spins and more! On the reels, find symbols like Eye of Horus, Horus, Ankhs, Scarabs, Lotus Flowers, A, K, J and Q. Eye of Horus slot allows you to set the game to your preferences. Set your stakes on the Bet Field, by toggling the plus or minus buttons to set your stakes. The Max Bet button allows you to set the maximum stakes at the maximum amount of paylines within a click. If you’re ready, click on spin and start winning! Amount of Paylines Selection: Set your paylines by selecting 1 to 10 of them to put to play. Coin Values: Stakes range from £0.01 to £10.00. The wild card takes form of Horus himself, which replaces other symbols, bar the scatter. Each time it lands on the grid, this expands to fill up the whole reel. The scatter symbol is the Pyramid, which triggers the bonus round of Eye of Horus slot. Trigger the Free Games Feature by landing three, four or five Pyramid symbols anywhere on the reels. Receive 12 free games to put to play, where wilds landing on the reels will award an extra spin. On the feature, low valued symbols upgrade to higher value symbols. The Gamble Option becomes active on a win spin. Choose between Card Gamble and Ladder Gamble to put to play. Card Gamble consists of choosing either Black or Red to double your wins and Ladder Gamble requires you to click on the 1:1 ratio to step up or land in a low value step.